So, like, private equity is apparently a big deal. Who knew? Readers of PETITION are very familiar with the growing influence, and impact of, private equity. We wouldn’t have juicy dramatic bankruptcies like Toys R Us, Nine West and others to write about without leveraged buyouts, excessive leverage, management fees, and dividend recapitalizations. Private equity is big M&A business. Private equity is also big bankruptcy business. And it just gets bigger and bigger. On both fronts. Private equity is pushing past its pre-recession heights and it is not expected to slow down. Mergermarket states that the value of private equity deals struck in the first half of 2018 set a record. PricewaterhouseCoopers expects that the assets under management in the private equity industry will more than double from $4.7 trillion in 2016 to $10.2 trillion in 2025. With twice as much dry powder to spend on deals, private equity firms will play a large role in determining the financial winners and losers of the Am Law 100 over the next five-plus years. It amounts to a power shift from traditional Wall Street banking clients and their preferred, so-called white-shoe firms to those other outfits that advise hard-charging private equity leaders. In August, the American Investment Council noted that there was $353 billion of dry powder leading into 2018. No wonder mega-deals like Refinitiv and Envision Healthcare are getting done. But, more to the point, big private equity is leading to big biglaw business, big league. Say that five times fast. It is hard to find law firm managing partners who don’t acknowledge the attraction of private equity clients. Their deals act as a lure, catching work for a variety of practice groups: tax, M&A, finance and employee benefits. And lawyers often end up handling legal work for the very companies they help private equity holders buy. Then, of course, there is always the sale of that business. A single private equity deal for one of the big buyout firms can generate fees ranging from $1 million to $10 million, sources say. “It’s kind of like there’s a perfect storm taking all those things into consideration that makes private equity a big driver in the success of many firms, and an aspirational growth priority in many more firms,” says Kent Zimmermann, who does law firm strategy consulting at The Zeughauser Group. Judging by league tables that track deals (somewhat imperfectly, as they are self-reported by firms), Kirkland has a leading position in the practice. According to Mergermarket, the firm handled 1,184 private equity deals from 2013 through this June. Latham is closest with 609. Ropes & Gray handled 323, while Simpson Thacher signed up 319. Hey! What about “catching work” for the restructuring practice groups? Why is restructuring always the red-headed step child? Plenty of restructuring work has been thrown off by large private equity clients. And Kirkland has dominated there, too. 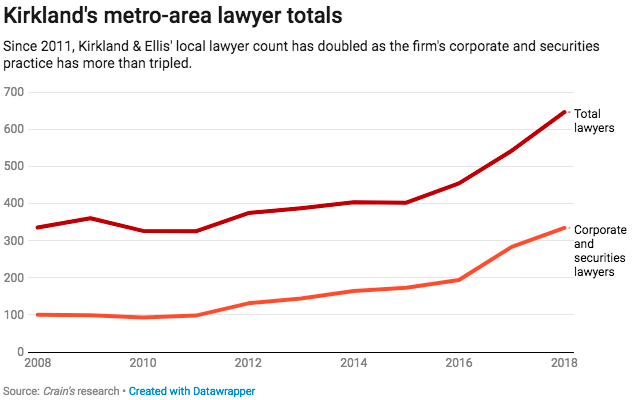 In just three years, Kirkland & Ellis has grown massively. The company, ranked 12th on the 2015 Crain's list of New York's largest law firms, has increased its local lawyer count by 61% to climb into the No. 4 spot. Much of that growth has come in its corporate and securities practice, where Kirkland's attorney count has nearly doubled in three years. The 110-year-old firm's expansion in this area is by design, said Peter Zeughauser, who chairs the Zeughauser Group legal consultancy. "There aren't many firms like Kirkland that are so focused on strategy," Zeughauser said. "Their strategy is three-pronged: private equity, complex litigation and restructuring. New York is the heart of these industries, and Kirkland has built a lot of momentum by having everyone row in the same direction. They've been able to substantially outperform the market in terms of revenue and profit." Kirkland's revenue grew by 19.4% last year, according to The American Lawyer, a particularly remarkable increase, given that it was previously $2.7 billion. Zeughauser has heard that a growth rate exceeding 25% is in the cards for this year. The firm declined to comment on whether that prediction will hold, but any further expansion beyond the $3 billion threshold will put Kirkland's performance beyond the reach of most competitors. Zeughauser, the consultant featured in both articles, thinks all of this Kirkland success is going to lead to law firm consolidation. Kirkland has been pulling top PE lawyers away from other firms. To keep up, he says, other firms will need to join forces — especially if they want to retain and/or draw top PE talent at salaries comparable to Kirkland. We’re getting PTSD flashbacks to the Dewey Leboeuf collapse. As for restructuring? This growth applies there too — regardless of whether these outlets want to acknowledge it. Word is that 40+ first year associates started in Kirkland’s bankruptcy group recently. That’s a lot of mouths to feed. Fortunately, PE portfolio companies don’t appear to stop going bankrupt anytime soon. Kirkland’s bankruptcy market share, therefore, isn’t going anywhere. Except, maybe,…up. That is a scary proposition for the competition. And those who don’t feast at Kirkland’s table — whether that means financial advisors or…gulp…judges. Apropos, on Monday, Massachusetts-based Rocket Software, “a global technology provider and leader in developing and delivering enterprise modernization and optimization solutions,” announced a transaction pursuant to which Bain Capital Private Equity is acquiring a majority stake in the company at a valuation of $2b. Dechert LLP represented Rocket Software in the deal. Who had the private equity buyer? Well, Kirkland & Ellis, of course. We can’t wait to see what the terms of the debt on the transaction look like. In other words, Akin Gump is pushing back against the company’s and the directors’ proposed subjugation of its committee responsibility. They are pushing back on directors’ poor and drawn-out management of the process; they are underscoring an inherent conflict; they are highlighting how directors know how their bread is buttered. Put simply: it is awfully hard for a director to call out a private equity shop or a law firm when he/she is dependent on both for the next board seat. For the next paycheck. The industry would stand to benefit if they did. Well, on Monday, counsel to the Nine West committee, Akin Gump Strauss Hauer & Feld LLP, filed a motion under seal (Docket 717) seeking standing to prosecute certain claims on behalf of the Nine West estate arising out of the leveraged buyout of Jones Inc. and related transactions by Sycamore Partners Management L.P. This motion is the culmination of a multi-month process of discovery, including a review of 108,000 documents. Accompanying the motion was a 42-page declaration (Docket 719) from an Akin partner which was redacted and therefore shows f*ck-all and really irritates the hell out of us. As we always say, bankruptcy is an inherently transparent process…except when it isn’t. Which is often. Creditors of the estate, therefore, are victims of an information dislocation here as they cannot weigh the strength of the committee’s arguments in real time. Lovely. That’s a $10k chart. That chart better be AI-powered and hurl stats and figures at the Judge in augmented reality to justify the fees it took to put together (it’s a good thing it’s redacted, we suppose). The debtor has to pay committee counsel $100k for it to put together an application to get paid? For heaven’s sake. Even committee members should be up in arms about that. And people wonder why clients are reluctant to file for bankruptcy. Speaking of independent directors, one other note…on the fallacy of the “independent” director in bankruptcy. Yesterday, October 9, Sears Holdings Corporation ($SHLD)announced that it had appointed a new independent director to its board. To us, this raised two obvious questions: how many boards can one human being reasonably sit on and add real value? At what point does a director run into the law of diminishing returns? Last we checked, it’s impossible to scale a single person. The question you want to be asking is "what sham transaction that probably benefits insiders is the independent director being appointed to bless" or "what sham transaction that benefitted insiders is the independent director being appointed to "investigate" and find nothing untoward with?" Those are good questions. Something tells us we’re about to find out. And soon. Something also tells us that its no coincidence that the rise of the “independent fiduciary” directly correlates to the rise of fees in bankruptcy. Tell us we’re wrong: petition@petition11.com. As we think about duopolies today, Google ($GOOGL) and Facebook ($FB) come to mind. The two large companies - recent controversies notwithstanding - represent a significant amount of annual ad revenue generation and have increasingly siphoned off market share and revenue from other advertising mediums; in other words, they have dominated the advertising industry. But this isn’t the kind of duopoly that we’re focused on today. Over last week’s brief holiday respite, we set out to examine restructuring activity in Q1 2018. We wanted to answer this question: who is dominating the restructuring industry? Well, Captain Obvious: Kirkland & Ellis LLP and Weil Gotshal & Manges LLP. We admit: we’re not surprised by this. We’ve been paying attention. In Q1 2018, Kirkland & Ellis LLP filed EXCO Resources Inc., PES Holdings LLC, Cenveo Inc., iHeartMedia Inc., and the Toys R Us “propco.” Weil Gotshal & Manges LLP filed Fieldwood Energy LLC, Tops Holdings II Corp., Claire’s Stores Inc. and Southeastern Grocers. That’s a meaningful and significant share of the large bankruptcy filings in the quarter. The industry is definitely a two-horse race when it comes to law firms and debtor filings. If we could long these firms, we would. But, there are some changes afoot. Quintessential creditor-side firms are encroaching on the debtor shops and vice versa. Milbank Tweed Hadley & McCloy LLP filed Remington Outdoor Company and Akin Gump Strauss Hauer & Feld LLP filed Rand Logistics Inc. and FirstEnergy Solutions Corp. In turn, Weil Gotshal & Manges LLP seems to be positioning itself to take a chunk of revenue out of other firm’s debtor-side deals where it can — by sitting in other seats at the table. Weil represents both the potential buyer and the private equity sponsors in iHeartMedia Inc. and the ad hoc first lien group in Cobalt International Energy. Said another way, while Akin and Milbank are no longer creditor-only shops, Weil is no longer a debtor-shop only. Getting even more granular, Weil Gotshal - along with Evercore Group LLC ($EVR) and FTI Consulting Inc. ($FTI) - have dominated the beleaguered grocery space. After working on the A&P Chapter 22 (which, for all three firms, was a round trip), the trifecta secured both Tops’ and Southeastern’s chapter 11 filings. Meanwhile, DLA Piper LLP seems to be securing a foothold in the healthcare space. It was involved in Adeptus Health last year and recently filed Orion Healthcare Corp. and 4 West Holdings LLC. This is a firm to watch as people suspect more healthcare flow on the horizon.